Here's the latest MAGIC Preview, offering a peek at what's in MAGIC Magazine for July. I hope you enjoy it! If you're not, a subscriber, please give us a try. 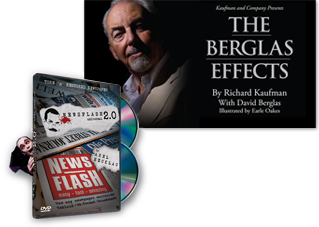 Check out our risk-free, one-month-at-a-time subscription plan at the bottom of this email. Of course, we still offer our annual subscriptions as well. 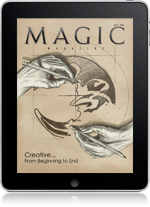 MAGIC is also available for your iPad in the App Store. The cost is $3.99 and it arrives within a few minutes. Best of all, you only buy it once, then you own it forever and can enjoy it wherever you want — Internet connection not required! There's a little over a week between the IBM Convention in Dallas (now through July 2) and the SAM Convention in Pittsburgh (July 13-16). That's just enough time to check the mail, do a little laundry, and take part in an amazing three-day event — right at home. It's the second annual Essential Magic Conference from Portugal, and it's coming to an Internet connection near you. The dates are July 7-9. The price is only $90, and you can experience 16 hours of video streamed live with 33 incredible speakers. (Okay, make that 32 incredible speakers and one magazine editor!) You also receive one year of access to the EMC website and video library, and a boxed set of DVDs with the entire conference and more professionally produced. This is a screamin' deal! Click here to find out more. And remember, MAGIC Live is just around the corner. The dates are August 14-17, 2011. The place is Las Vegas, Nevada. 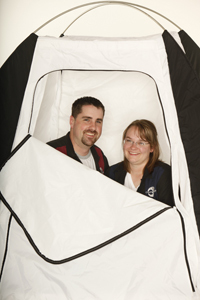 The registration is $335, and the hotel rooms are only $36 per night. It's the bargain of the summer! Simply click here to register securely online. COVER: They're Going Out of Business, So Why are They Smiling? I pull my car up to an address in Payson, Utah, a small town about sixty miles south of Salt Lake City. This residence is the unlikely headquarters of one of magic's most dynamic manufacturers. I have arrived at the home of Brian Daniel South and his wife, Rebekah, the founders and proprietors of Creative Magic. Everywhere I look, there are mailing boxes and long, sausage-shaped Styrofoam tubes, wooden dowels, black-and-white cloth sleeves, instruction pamphlets, and embroidered cloth bags. The garage and basement are packed with merchandise, and I'm told that even more product is stored offsite. "It looks like you two are doing great!" "We are," says Brian. "We were confident that Creative Magic would be successful, but we have exceeded our wildest expectations." "I guess you need a bigger house." Brian laughs. Then he stuns me with his reply: "No, we're getting this one back. We're going out of business!" For a moment, I'm not sure I've heard him correctly. 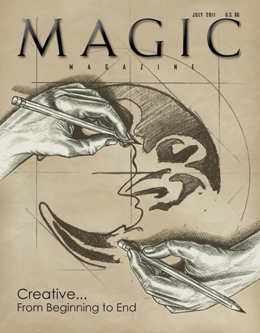 "I know people will think we're crazy," Brian says, "but on June 24, 2011, Creative Magic will cease manufacturing and begin to liquidate its inventory." My response: "You've got to be nuts!" By 1947, after over four decades entertaining the public, Harry Blackstone was unquestionably one of America's greatest and best-known magicians. 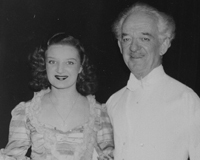 It was in that year that seventeen-year-old Adele Friel was swept into Blackstone's world of magic, making the transition from solo song-and-dance act to one of "Mr. B's gorgeous girls" in the blink of an eye. For the next three seasons, she trouped with Blackstone, playing an integral role in his show, both onstage and backstage. What follows are excerpts from Adele's forthcoming book, Memoirs of an Elusive Moth. In it, she offers a rare glimpse behind the scenes of Blackstone's company, what is was like to work and perform in his illusion show, and tells her tales in a way no one else can: from a first person, "I lived it" perspective. Principally self-taught, Farrell Dillon first began learning to make playing cards obey his every command at the age of twelve. Most magicians perform their manipulation segments to music, impressing audiences with knuckle-busting moves that take years to master and earning well-deserved applause. But when Farrell appears before an audience, in addition to timely ovations, you hear a sound not usually heard during such magical exhibitions of skill: the sound of riotous laughter — not to mention Farrell's own running commentary. It was a show created to both entertain and unite the people of North Korea. The monumental Grand Magic production was mounted in a 150,000-seat stadium earlier this year, with massive illusions playing out before — and above — the crowds. When his name comes up in conversation, it is most often in reference to his complete mastery of two classics of magic. These are by no means the only effects he does, but for more than fifty years Claude Rix of France has been known in international magic circles as "that fellow with the pearls" or "the man with the tomatoes." Though his reputation for definitive performances of both those effects is justified, he is — as we shall see — a man of many parts. Claude still performs and lectures, and in this issue provides two routines from his close-up repertoire, excerpted from the forthcoming Conjuring and Correspondence by Claude Rix and Hervé Pigny. 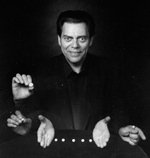 The International Magic Experience (IMX) took place at The Orleans Hotel in Las Vegas, May 23-25. This was the premiere convention for South African producer Craig Mitchell, and the reported attendance was over 400 for this lecture-driven event. The Magic Collectors Weekend, under the auspices David Ben's Magicana for the second year in a row, transpired at the Westin Hotel in Chicago, May 19--1. It was the 42nd such convening of scholarly talks and learned fellowship. An exhibition focusing on the career of David Copperfield is currently on display at the Musée de la Magie in Paris, France. French writer Benoit Grenier, who previously authored a biography of Copperfield and worked on the museum project, says "The exhibition shows various aspects of David's life and career; it features programs, posters, memorabilia, previously unseen photos, and original costumes and props." Guy Hollingworth brings his one-man show, The Expert at the Card Table, to Southern California for a month-long run; and a trio of singing magicians — Desimo, Helge Thun, and Topas — performSing Sala Bim. John Lovick delivers a complex but powerful card routine suitable for large audiences. Curtis Kam offers a fruit production that could be the opener to your next close-up engagement. "Talk About Tricks" newcomers Ollie Meaning and Jonathan Davidson bring us some card ideas, and Jeff Prace returns with an Expertalk on Tilt. People tell me their wild-eyed, pie-in-the-sky ideas all the time. "I'm thinking of having a horn surgically implanted in my forehead." "Hmmm, kind of a unicorn routine?" "Yeah. Maybe a Card Stab or something." Everyone thinks their wild-eyed, pie-in-the-sky idea is great — if only they had the money and the resources. But there have been lots of shows with wild-eyed, pie-in-the-sky promises that spent plenty of money to get nowhere. After making a prediction on a napkin, you spill a few drops of coffee on the table and soak it up with a napkin. An irregular-shaped stain emerges through the napkin, which looks like Rorschach inkblot. Someone describes what the coffee stain looks like -- a bat or a butterfly or a break-dancing amoeba, maybe. You turn over the prediction-napkin to show the inked outline of a shape that accurately matches the randomly formed coffee stain. The letter that is the focal point of this article is a bit of a departure from items featured here previously, in as much as the writer, J.B. Hargett, was not a magician. He was an expert at chirognomy — the art of character reading based on the shape and features of the hand. 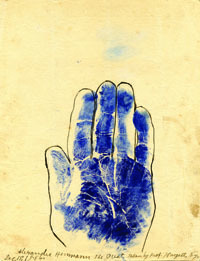 Upon hearing the news of Alexander Herrmann's death, Hargett immediately contacted Adelaide and requested permission to make an inked impression of her husband's hand. Perhaps sensing that this slightly creepy procedure would ensure her husband's place among the most famous names of the time, she acquiesced. In March 2011, Stephane Vanel had an opportunity to showcase at the Paris Hotel. They decided to give him a chance, and the show was set to open June 1. Stephane had two months to put together an hour-long show. That sounds like a lot of time, but it was a real challenge. Click here to see the entire list of what's coming in the October issue of MAGIC Magazine.